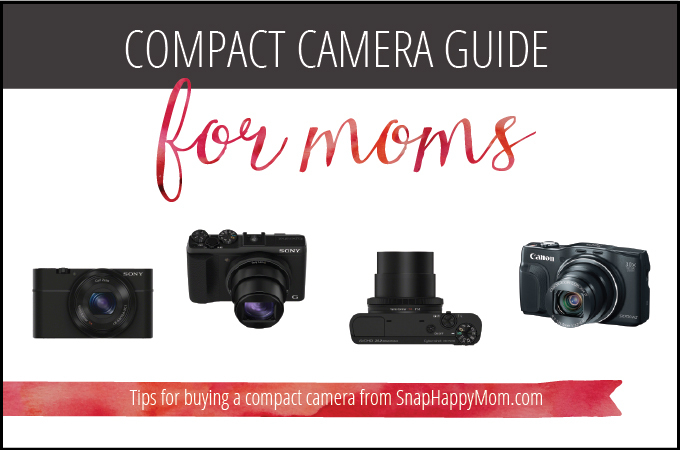 This is a camera guide for moms who are looking for a small, compact camera. If you feel like a DSLR is too big, heavy, expensive, or confusing, then you should consider a compact camera that might fit your needs better. Granted, I am still a big believer in learning how to use a DSLR, but these are the cameras I recommend for people who are looking for a compact camera. A quick word about “compact cameras” versus “point & shoot” cameras: the consumer world has incorrectly lumped anything that is not a DSLR into the point & shoot category. Yes, many basic cameras are so simplified that all you can do is point it at something and shoot. Obviously, this is the type of camera that causes frustration for many parents. But there are plenty of compact/small, cameras that feature extra controls, scene modes, and even aperture/shutter/manual priority modes…they just aren’t cheap. So keep it in mind that you’re probably looking for a compact camera, not just a point & shoot. If you want something lighter and more travel-friendly than a DSLR, get a high-end Sony compact camera. Sony does high-end really well, including putting a f/1.8 lens on a compact camera, which no other brand has done. Obviously, these cameras feature DSLR-level prices, but these are great options for photographers who want something smaller without giving up quality or creative control. Compact cameras do not get better than this: super nice f/1.8 lens, a high-quality image processor, a pop-up viewfinder, and a rotating LCD screen. This has come down in price a ton! The image processor on this camera is simply the best Sony has ever made (and even Nikon and Canon use Sony processors). A pop-up viewfinder is tons more accurate for composing shots, but if you need to use the LCD is will swivel 180 degrees for selfies. Obviously, you can shoot in full manual, but there are scene modes for the learning users as well. You bet that it has Wi-fi and NFC too. If you’re willing to give up interchangeable lenses, this is THE camera to keep in your purse when you don’t want to lug around a DSLR with your kids. Want the best bang for your buck? Try the Sony DSC RX100 . It’s compact and fits in your pocket, but still has a super nice f/1.8 lens! Why do this matter? That lens is incredibly fast and sharp, and will get you gorgeous depth of field for portraits. You can also shoot in raw and full manual on this camera, which is a really big deal if you’re used to a DSLR. I seriously love this camera. I recommend last year’s Sony HX80V as a solid compact camera choice for under $350. This camera is my favorite in this price range, and is one of the best compact cameras available for less than it costs to buy a new DSLR. It’s small and fast, and has a fantastic 30x zoom. Sony supplies other camera brands with image processors, but keeps its best processor within the Sony brand, which means that this camera has better light sensitivity, color, and image resolution than its competition. Also in this price range are the Nikon Coolpix A900 and the Canon PowerShot SX730 . They are very similar in ability and price. Both can shoot in specific scene modes, with presets already configured for that situation. They both have video capabilities, wi-fi connectivity, and image stabilization as well. Each camera here has some slight advantages over the other: the Canon can shoot better quality video, has a slightly longer zoom, and has Near Field Communication (which lets Android phones instantly connect to your camera). The Nikon has a better focusing system and macro abilities (you can focus on items just a cm away from the camera), as well as a better screen to see your pictures. But these are very small differences that the average user won’t even notice. The under two hundred dollar range is tough: you’re not going to find a camera that cheap that can do everything well. Cameras in the under $200 range will struggle to take sharp pictures in low light. If you cannot simply wait and save for one of the nicer cameras above, then these are my recommendations. For less than $200, try the Nikon Coolpix S6800 , the Sony DSC WX220 , or the Canon PowerShot ELPH 340 HS . All three cameras have very similar specifications, and are a toss up when compared against each other. The most important thing these cameras have is the CMOS sensor, which will help in low-light situations inside your house, but you’re still at the mercy of the size of that sensor and a slow shutter speed. They also all have some form of image stabilization, wi-fi capabilities, and plenty of megapixels. This post contains affiliate links for your convenience. I may be compensated if you purchase through my links. Very helpful! I love your camera guides!